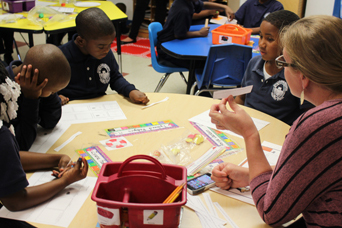 During this school year, Alliance for Progress Charter School will implement the Student Assistance Program (SAP) in grades K-8. SAP is a process designed to identify and address students who are experiencing problems that pose a barrier to their learning and academic success. The SAP team is composed of a group of specially trained school staff, and community agency liaisons, who work together to assist students and families by making in-school resources available, and providing information about community resources. Parents are encouraged to be involved in the process. SAP does not provide treatment or implement disciplinary consequences. Referrals may be made to the program through the school counselor by staff, family members, community agencies, students or any other concerned persons. Students seeking help may also refer themselves. If you have any questions or concerns, please contact Mrs. Cummings at 215.232.4892 ext. 3501. The special education policies detailed herein were designed and will be implemented in accordance with all relevant federal and state statutes and regulations including: the Individuals with Disabilities Education Act (IDEA 2004 � PL 108-446), No Child Left Behind, Section 504 of the Rehabilitation Act of 1973 (504), the Americans with Disabilities Act (ADA), the Family Education Rights and Privacy Act (FERPA), and Pennsylvania Department of Education regulations on Charter School Services and Programs for Children with Disabilities (Chapter 711). Zero Reject: As an LEA, AFPCS will provide all students an equal education opportunity, and will not deny any students an education on the basis of a disability. Individualized Education Program (IEP): In accordance with IDEA, all AFPCS students identified as having a disability and in need of special education services will be provided a written IEP. The IEP will include current educational level, annual goals, specific educational objectives, special education and related services to be provided, dates for initiation of service, anticipated duration of service, and evaluation criteria. Free Appropriate Public Education (FAPE): All eligible AFPCS students will be provided appropriate special education (determined on a case-by-case basis) and related services at the expense of the charter school in conformity with each student's IEP. Least Restrictive Environment (LRE): AFPCS will ensure that students with disabilities are educated to the maximum extent appropriate with their non-disabled peers. The educational philosophy of AFPCS is to bring all students into one community of learners, and our preference is to educate students, whenever appropriate, with the appropriate supplementary aids and services necessary for them to participate in the regular classroom experience with their peers. Due Process and Parental Involvement: AFPCS understands that parents must be notified of the intent to evaluate their child for services, and their consent to an initial evaluation before the process begins. Parents will also be involved in the IEP process and will be required to provide consent to the initial placement and provision of services. Provided and administered in the child's native language or other mode of communication. Validated for the specific purpose for which they are used. Tailored to assess specific areas of educational need and not merely those designed to provide a single general intelligence quotient. Reflective of the child's aptitude or achievement and not reflective of the child�s impaired sensory, manual, or speaking skills. Students who are not eligible to receive special education programs and services may qualify as handicapped students and therefore be protected under federal statutes and regulations intended to prevent discrimination. AFPCS will ensure that qualified handicapped students have equal opportunity to participate in the school program and extracurricular activities to the maximum extent appropriate for each individual student. In compliance with federal law, AFPCS will provide to each protected handicapped student without discrimination or cost to the student or family, those related aids, services or accommodations which are needed to provide equal opportunity to participate in and obtain the benefits of the school program and extracurricular activities to the maximum extent appropriate to the student's abilities. In order to qualify as a protected handicapped student, the child must be of school age with a physical or mental disability that substantially limits or prohibits participation in or access to an aspect of the school program. These services and protections for "protected handicapped students" may be distinct from those applicable to eligible or thought-to-be eligible students. AFPCS or the parent may initiate an evaluation if they believe a student is a protected handicapped student. What are McKinney Vento Students Entitled to? A child whose family becomes homeless may remain in the school he/she was attending prior to becoming homeless for the duration of the school year. If it is feasible, a student may transfer to a school if it is closer to his/her transitional housing. The receiving school may not prevent or delay the enrollment of a homeless child by requiring proof of residency. The school may seek written confirmation of shelter residency, but may not refuse a child admission pending such confirmation. Homeless children living more than one mile from the school should be given free SEPTA student passes (see Transportation Procedure for Homeless Students). The school can contact the Department of Health (215) 686-5000 to obtain oral confirmation of immunizations. This confirmation can be accepted as verification for enrolling a student *(BEC 42 USC & 11303). Written confirmation should be requested and received within 30 days. Questionnaire is sent to all families as part of the enrollment packet. Parents or students may notify us directly when/if a homelessness situation arises. Teachers or Staff my notice a change in students regular routine, hygiene, or behavior and bring the concern to the attention of the Director of Student Services, School Nurse, and/or School Counselor via a Student of Concern Form. McKinney Vento informational posters are displayed in both main offices and/or areas of the school that parents frequent. The family is contacted and supports in the areas of uniforms, transportation, free lunch, and other school fees are offered. The proper forms are submitted to the School District of Philadelphia to report the instance and to receive support with available resources. Click here to learn more about the Pennsylvania Education for Homeless Children and Youth State Plan. For more information about special education programs or procedures please contact the Special Education Director at 215-232-4892 x 2425.